Cheers, cheers, and cheers again for a children’s book series called Guys Read. I had no idea this existed, but it is a fabulous way to grab the attention of middle-school boys. I picked up the most recent in the series, and will have to back track to review the rest, but this children’s book is superb. What makes it especially great is that it is a collection of short stories by well-known and very accomplished children’s book authors. We are talking about Sharon Creech, Lemony Snicket, and Pam Ryan, among others, all of who have written excellent children’s books. The format of short stories is a perfect ploy, since reluctant readers often come with a shorter attention span. What a brilliant idea to give a reader the satisfaction of completion, while offering a substantially interesting story. 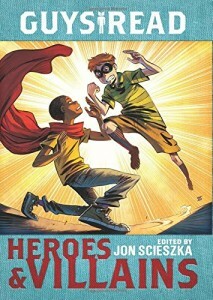 I loved each of the stories in this children’s book, all centered around heroes and villains. Each story had a different angle, each was well-written, and many were thought-provoking. From illegally crossing the border, to a investigative newspaper story, to a story set in Russia, there’s something for everyone. Perhaps the young reader might not relate to all the stories in this children’s book, but surely he could find two or three. A bonus is that at the end of the book, each author is listed, along with other books by that author. Again, a brilliant idea, because if even only one story worked for the young reader, now there was a resource to find more just like that one, by getting other books from the same author. Not to mention for me, who is always looking for a good children’s book to review, now I have an entire bibliography. Put this children’s book on your ‘must-read’ list if you have a middle-school boy who is avoiding reading. And if you have one that loves reading, get this anyway!